THE ICE BUCKET Challenge just might have peaked, now that absolutely everyone you know has done it. But luckily, there are still people out there trying to go one better. Like scientist Moe Qureshi, who decided to do it with liquid nitrogen. “Do not try this at home, because this is extremely dangerous and not safe,” he tells the camera. If you’re interested: here’s why Qureshi’s head didn’t freeze. Please, nobody try this at home. 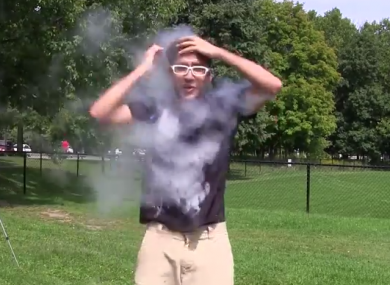 Email “Someone did the Ice Bucket Challenge with liquid nitrogen, which is really quite dangerous”. Feedback on “Someone did the Ice Bucket Challenge with liquid nitrogen, which is really quite dangerous”.